With traditional CRM tools, sales people add basic details about the companies to the database, then a few notes about their interactions. AI has helped automate some of that, but Gong.io wants to take it even further using voice recognition to capture every word of every interaction. Today, it got a $40 million Series B investment. The round was led by Battery Ventures, with existing investors Norwest Venture Partners, Shlomo Kramer, Wing Venture Capital, NextWorld Capital and Cisco Investments also participating. Battery general partner Dharmesh Thakker will join the startup’s board under the terms of the deal. Today’s investment brings the total raised so far to $68 million, according to the company. Indeed, $40 million is a hefty Series B, but investors see a tool that has the potential to have a material impact on sales, or at least give management a deeper understanding of why a deal succeeded or failed using artificial intelligence, specifically natural language processing. Company co-founder and CEO Amit Bendov says the solution starts by monitoring all customer-facing conversation and giving feedback in a fully automated fashion. “Our solution uses AI to extract important bits out of the conversation to provide insights to customer-facing people about how they can get better at what they do, while providing insights to management about how staff is performing,” he explained. It takes it one step further by offering strategic input like how your competitors are trending or how are customers responding to your products. Bendov says he started the company because he has had this experience at previous startups where he wants to know more about why he lost a sale, but there was no insight from looking at the data in the CRM database. “CRM could tell you what customers you have, how many sales you’re making, who is achieving quota or not, but never give me the information to rationalize and improve operations,” he said. The company currently has 350 customers, a number that has more than tripled since the end of 2017 when it had 100. He says it’s not only that it’s adding new customers, existing ones are expanding, and he says that there is almost zero churn. Today, Gong has 120 employees, with headquarters in San Francisco and a 55-person R&D team in Israel. Bendov expects the number of employees to double over the next year with the new influx of money to keep up with the customer growth. Workato, a startup that offers an integration and automation platform for businesses that competes with the likes of MuleSoft, SnapLogic and Microsoft’s Logic Apps, today announced that it has raised a $25 million Series B funding round from Battery Ventures, Storm Ventures, ServiceNow and Workday Ventures. Combined with its previous rounds, the company has now received investments from some of the largest SaaS players, including Salesforce, which participated in an earlier round. At its core, Workato’s service isn’t that different from other integration services (you can think of them as IFTTT for the enterprise), in that it helps you to connect disparate systems and services, set up triggers to kick off certain actions (if somebody signs a contract on DocuSign, send a message to Slack and create an invoice). Like its competitors, it connects to virtually any SaaS tool that a company would use, no matter whether that’s Marketo and Salesforce, or Slack and Twitter. And like some of its competitors, all of this can be done with a drag-and-drop interface. The AI/ML system also handles errors and offers features like sentiment analysis to analyze emails and detect their intent, with the ability to route them depending on the results of that analysis. 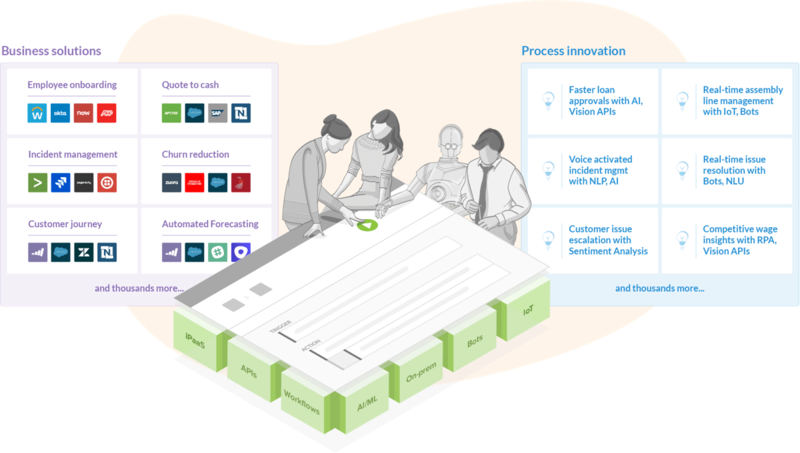 As part of today’s announcement, the company is also launching a new AI-enabled feature: Automation Editions for sales, marketing and HR (with editions for finance and support coming in the future). The idea here is to give those departments a kit with pre-built workflows that helps them to get started with the service without having to bring in IT. Amplitude announced this morning that it has raised $15 million in Series B funding. In the past, the web and mobile analytics company has pitched itself as a more affordable alternative to Mixpanel. More recently, CEO Spenser Skates said the bigger vision is to make user data available to everyone in a company, not just data scientists.